That’s a good indication that a carburetor was not rebuilt properly. Disassembly of all components is extremely important. 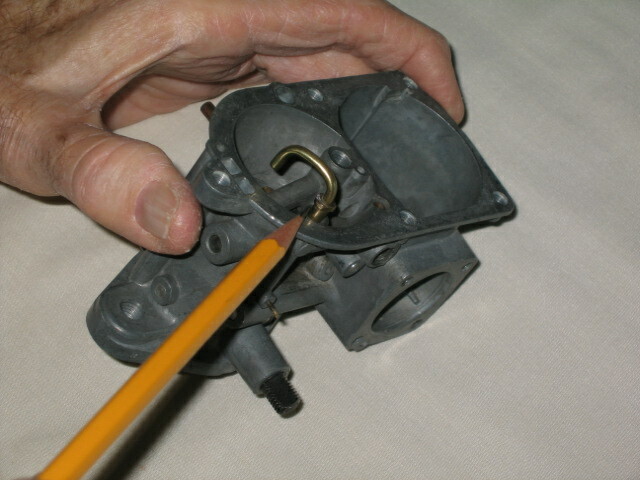 Even the tiniest foreign particle that is allowed to remain somewhere in a carburetor can plug a jet or other orifice. In the 1970’s a VW specialist let me in on the secret to removing this plug. 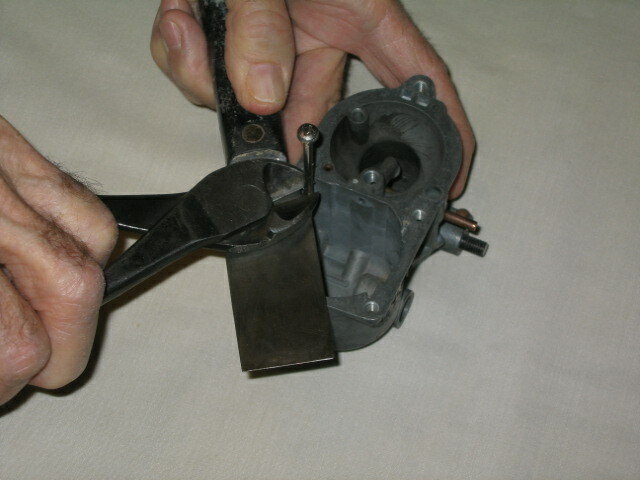 Looking down into the opened carb bowl, you can see the small, round brass plug-in the corner—on the accelerator pump side of the carburetor. Looking into the drilling from the accelerator pump side (with the accelerator pump removed) you might be able to see the glint of the check ball that is captive beneath this brass plug. 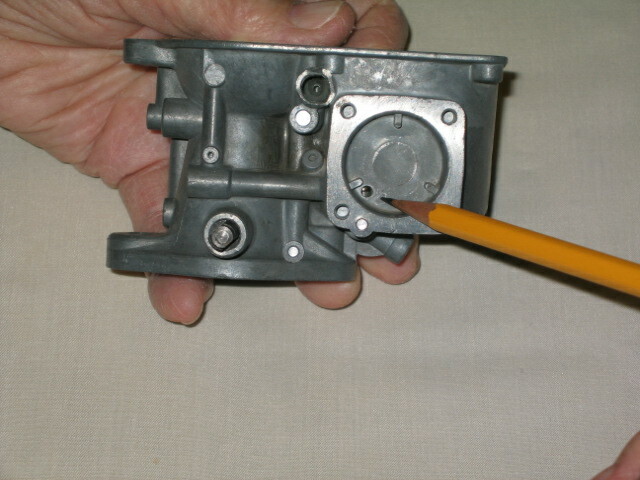 Its function is to allow gas to pump only one way–from the bowl on its way to the injector tube (also called the accelerator pump discharge tube). What is necessary for removing this brass plug is a tail light lens screw. If you do not have one, beg, borrow, but do not steal, one from your local VW specialist. 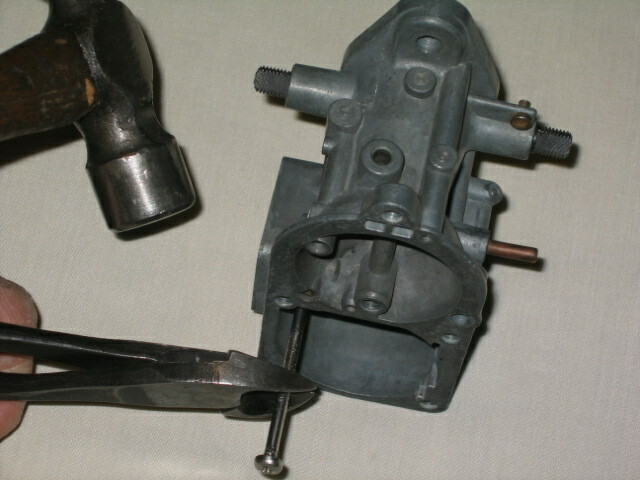 The screw should come from at least a 1968 or later Beetle tail light lens and must be long enough to extend from the bottom of the carb bowl and well past the edge of the opened bowl. I like to use a fairly long one so that it can be used with several models of carburetors. It would be great to be able to use one from a ’67 Beetle lens but, unfortunately, those are too short for the purpose. 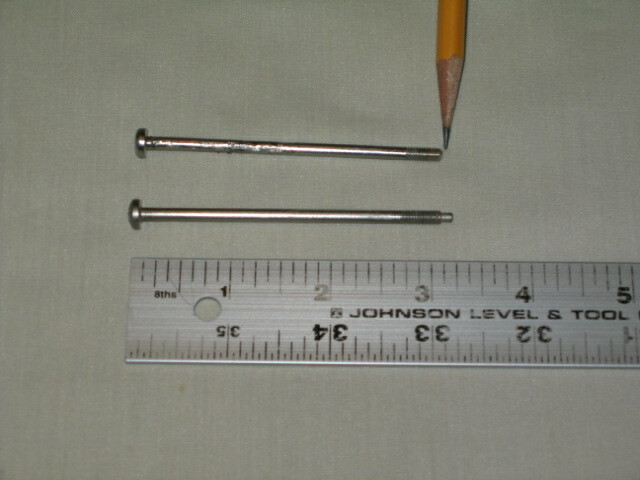 Try to find one that is about 82mm in length–measuring from the top of the screw head to the very tip (about 3 1/4th inches). You will note that each tail light screw has a self-centering tip that is not threaded (about 2 1/2 mm or 1/8th inch in length). This tip must be removed so that the screw will bottom when screwed into the brass plug. Carefully remove the tip right to the threaded portion but do not get into the threads or you will be unable to screw it into the plug. The screws are fairly soft metal and can be ground using a file, although using a grinding wheel is much faster and easier. Now, you are ready to screw the tail light screw into the brass plug. Use a Philips Head screwdriver to do this. You will feel it when the screw bottoms. Make sure that the screw is firm in the plug but do not over-tighten it. Now, place something on the edge of the bowl so as not to mar the mating surface when you pry on the screw. 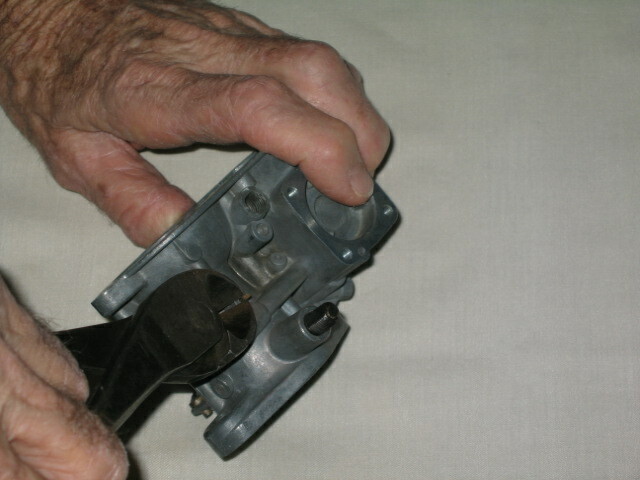 Using a pair of dikes or other appropriate pliers, pry upwards. The plug should pop out. But…should the plug be stuck, have someone to hold the carburetor on its side. Get a firm hold on the screw with pliers or a pair of dikes. 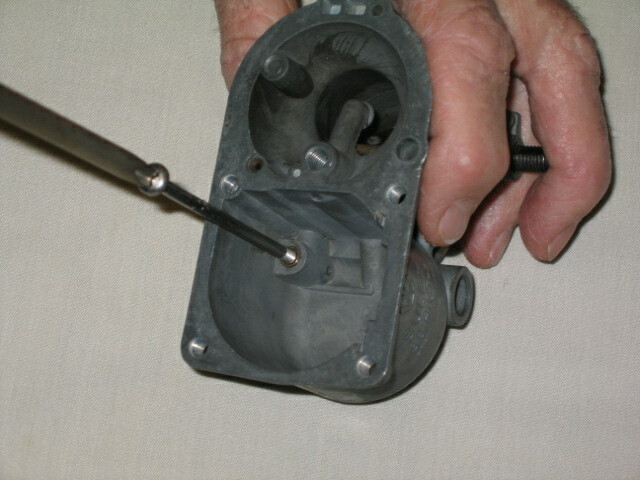 Using a small hammer, whack the dikes away from the carb and the plug should pop out. Invert the carb over a container or shop cloth and the check ball will fall out. 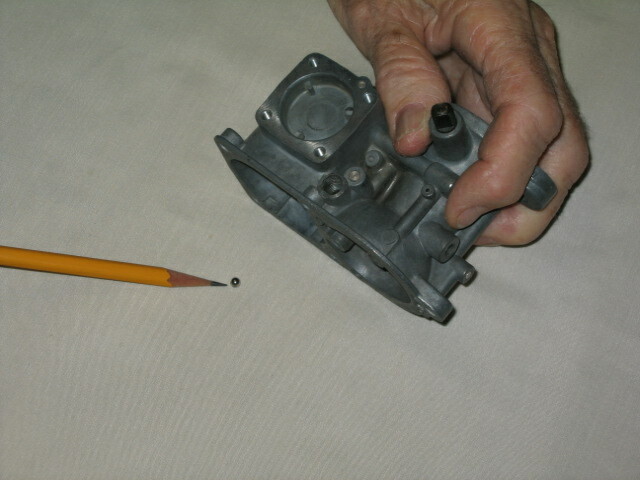 When you have completed the cleaning of the carb and are ready for reassemble, simply drop the check ball into the hole. With the tail light screw still firmly screwed into the brass plug, install the plug. Gently tap on the screw head with a screwdriver handle or some other light-weight tool until you “feel” that the brass plug has seated. You will be able to “feel” the difference in resonance when the plug has bottomed. Unscrew the tail light screw and put it away for a later rebuild. Now for the second check ball. This one is a very tiny ball that is located inside a long passage, again on the accelerator pump side of the carb. 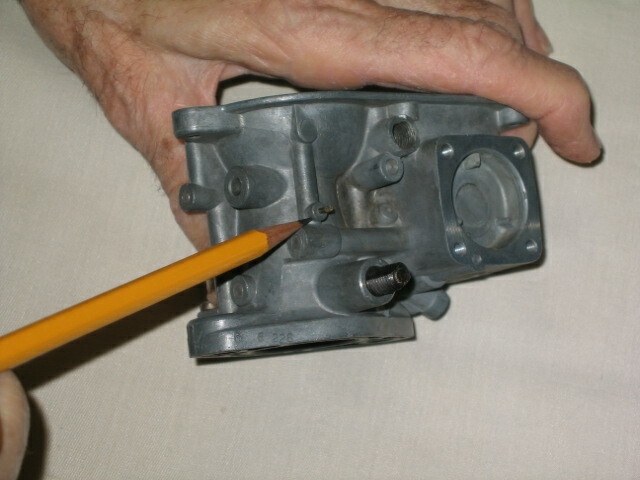 This passage is critical for gasoline passing from the accelerator pump to and through the injector tube–the brass tube that seats into the carb’s edge and squirts gasoline downward into the carb’s throat. 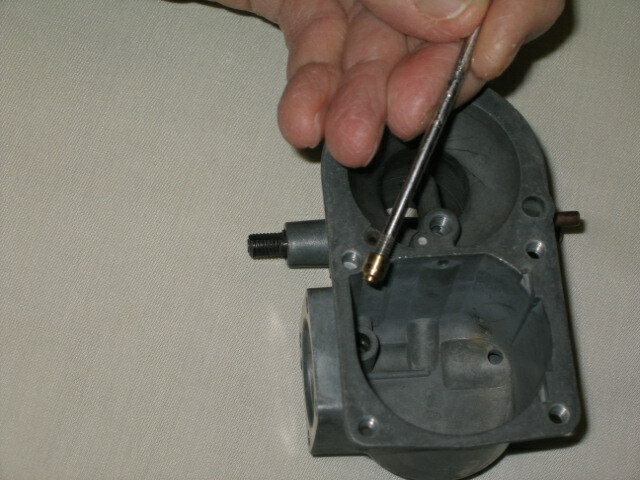 The key to removal of this check ball lies in the removal of a tiny brass pin–also located on the accelerator pump side. Using a pair of good needle-nosed pliers or a pair of dikes, gently take hold of the brass pin. I find that using dikes is the best way. However, do not pinch hard or you will cut the pin–it is very soft metal. 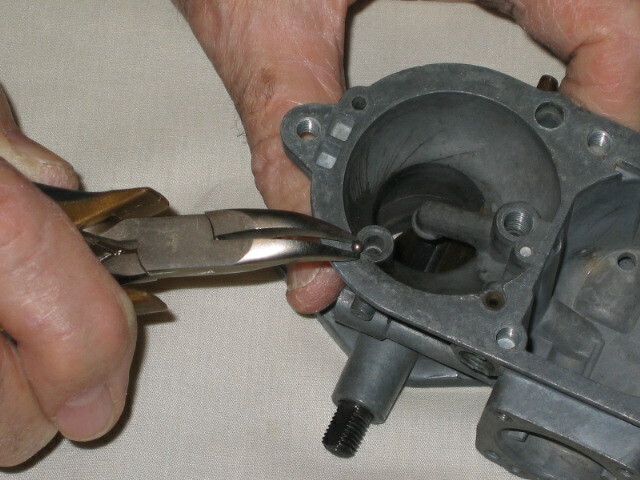 Gently pry a little at a time, with each pry, moving the dikes closer to the carb’s side for a good prying point. Try not to mar the pin! Eventually, with care, the pin should remove. 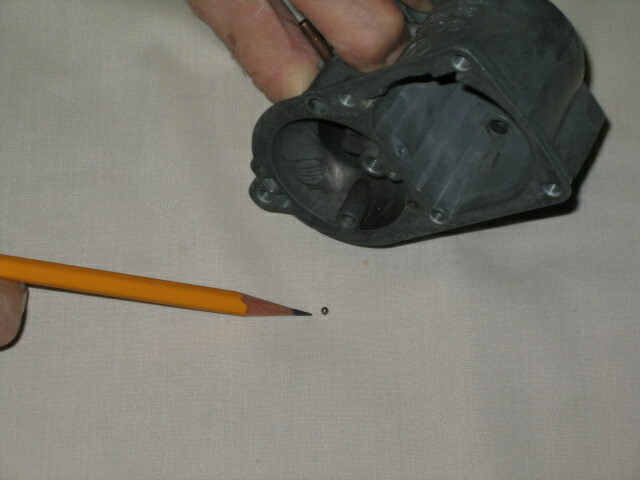 The ball is going to exit from the hole in the rim of the carb where the fuel injector tube was located. Turn the carb upside down over a container or shop rag and allow the check ball to fall out. I have found some of these tiny balls to be stuck. With the pin out, a blast of compressed air into accelerator pump drilling, thumb held over the bowl check ball opening, should do the trick. However, be forewarned that you should hold a rag over the exit hole on the rim, because the ball will be shot out at high speed and could otherwise be lost. If you still are unsuccessful in removing the ball, even after the pin has been removed, try soaking and then use the compressed air. If you have been successful in the removal of this tiny check ball and have completed the cleaning process, installation is the reverse–drop the tiny ball back into its orifice. It will “seat” itself. 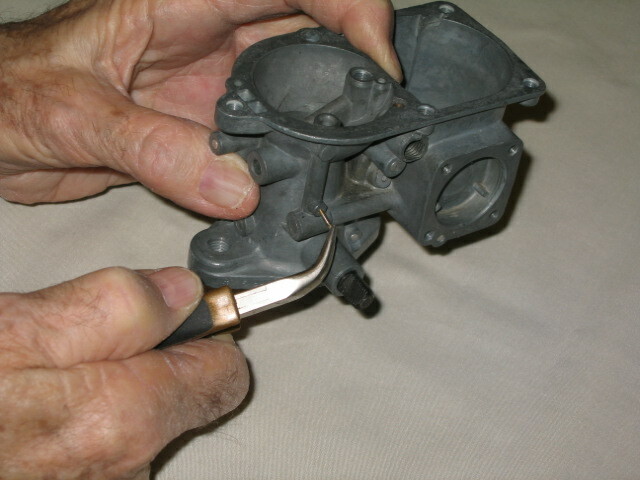 With the carburetor sitting upright (as it normally would sit on the manifold), insert the brass pin and lightly tap until you can “feel” it seat. 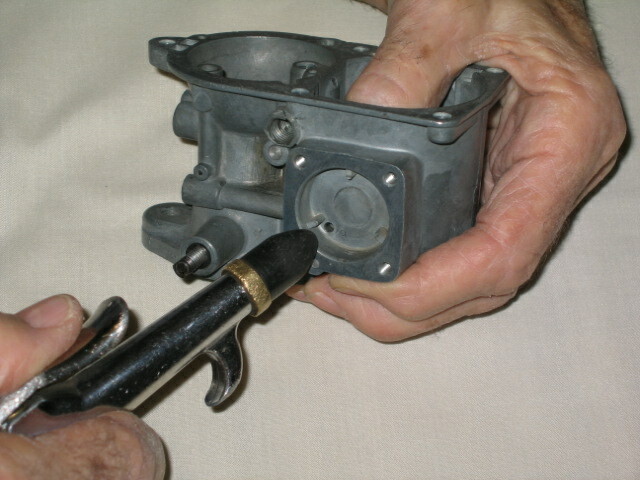 Once the pin has been installed, by shaking the carb, you probably will be able to hear the check ball clicking in its seat. A final note: The check balls are highly polished—some a golden color and some, silver colored. After cleaning, the check balls still should retain their extremely shiny appearance. If a ball is oxidized and cannot be cleaned by soaking and rubbing clean with a cloth, it is best to cannibalize another carburetor for a good one. The key to good seating is a clean carb and good, clean check balls. Great info Jay!! Can you please reccommend an approved rebuilder in the San Francisco Bay Area? One that you know will follow all the steps you mentioned. If there’s no one locally you can reccommend, please let me know who I should consider sending my carb out to (and to one who won’t break the bank:). Thanks Jay! None locally. I’d give Vintage Werks or Volksbitz a try. Both are fantastic. Good afternoon, Michael! Glad that you like the article. Jay is a wealth of knowledge! 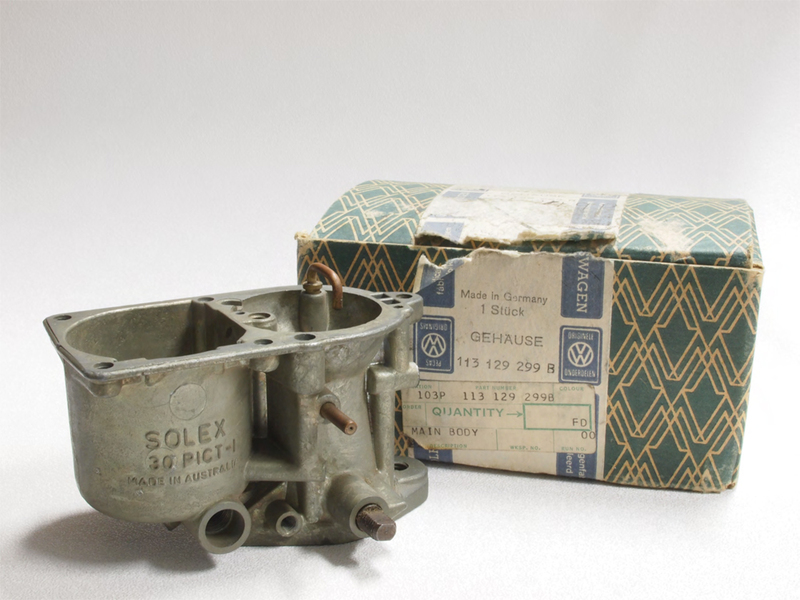 Tim is a Solex Carburetor Specialist. He knows them backwards and forwards. The original check balls usually are re-usable. I toss them only when they are corroded. What a great article! Thanks Jay. *Cracks whip. Fine, get back to work! Hello, Hank…Thanks for checking in! Most of the 28 series carbs for the Beetles have the third check ball. It is part of the Power Fuel System. For Ghias and Buses–most did not have this check ball during the 28 series run [28 Pict and the 28 Pict-1 (2)]. 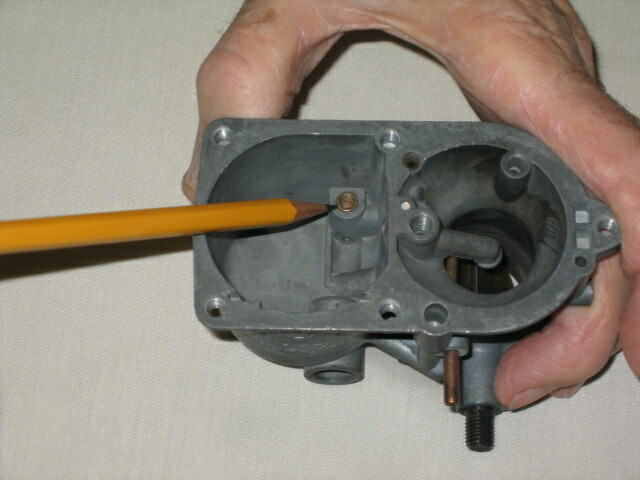 The third check ball is located beneath the brass plug located on the rim of the throttle body (lower half of the carb) on the throttle lever side of the carb. Once the brass plug is removed, the check ball is immediately visible. I do not know the reason for the Beetles to have the check ball and the Bus and Ghia usually not. Notably, the Bus and the Ghia always had a larger air correction jet than did the Bugs. There may be some correlation here. If I learn, I’ll let you know. Thanks for following up on my “third check ball” question. Now to pull a carb and check out thus new information. Best wishes for a Merry Christmas. You are awesome Jay, nice article, real Macgyver moment there with the lens screw. Jay, Eric have a great Christmas and a happy and fruitful new year to you and your families. I must get writing some more articles, it takes it out of you moving somewhere new but i’m getting there slowly. Thinking of an article on yearly vehicle inspections from around the world. I understand that in the US you didn’t have them apart from smog check, in some countries in Europe anything modified is banned and the car has to be as it left the factory even down to its original radio!! Hello, Matt…It’s good to hear from you! Here in Texas, if a vintage vehicle is registered as an Antique/Classic Vehicle, it becomes exempt from the otherwise yearly inspections. Even if left to the conventional registration, if a vehicle is 25 years or more old, it goes through a very limited inspection (tires, brakes, horn, lights-turn signals and wipers–no emissions). Thank you for the Christmas wishes! I wish you and yours the same. May your new residence prove more than satisfactory and may you have Good Health and an Enjoyable Life during the New Year! See you “down the road”! Please post the sizes of the balls. I lost the injector tube ball. I recently rebuilt the carb on my ’68 bug, and I’m afraid I scratched or warped the brass pin that holds in the second check ball, so now fuel leaks out around the pin when the accelerator is pressed. Nobody sells that part and I don’t want to have to buy a new carb just for that little piece. Does anybody know a good fix? There is nothing particularly special about the brass pin so making a replacement shouldn’t be difficult. Measure the diameter of the pin and see if it corresponds to a standard wire gauge (say 10 gauge or 12 gauge copper wire) and, if it matches, use it. If not a good match, get a piece of copper or brass a little larger in diameter, chuck it in a rotary tool (like a Dremel), and sand it down to a nice interference fit. I was in a hobby shop today purchasing some 4-40 X 1/2″ cap head screws in order to repair a 1960 VW dashboard light switch. I strolled around just to see what else they sold just in case I need other little bits and pieces in the future. I happened to notice they sold all diameters of brass rod. Maybe that’s also an option for those that need to make small brass bits. Thank you for this article Jay! I have one question about the second check ball. What exactly is it’s purpose? I ask because my accelerator pump injector drips when parking my bus after driving it. It’s slight, but leads to flooding.